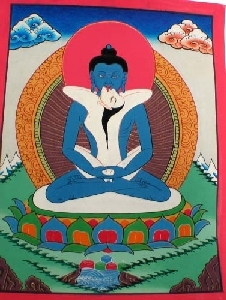 This beautiful, traditional Tibetan Buddhist paintings are known as Thangkas. They are all hand-painted in Nepal but skilled, dedicated artists; in fact when I requested that they sign and date each painting they refused because they felt it would be unethical to do so because of the religious connotations in the pieces. The word Thangka is defined as an item that can be rolled up, as in a scroll. 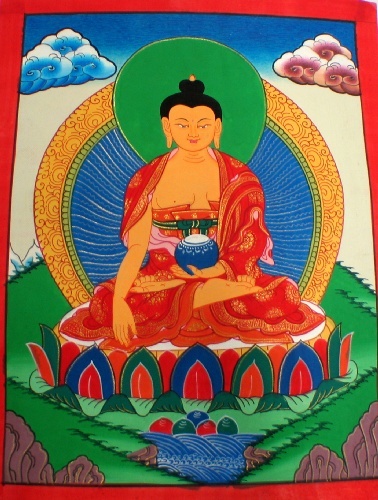 Tibetan thangkas are typically paintings of Buddha, deities or bodhisattvas. 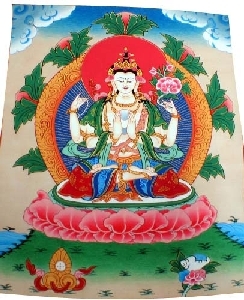 Tibetan thangkas can also be, among other things, paintings of mandalas, the wheel of life, or scenes from Buddha's life. Tibetan thangkas are more commonly used during reflection and meditation, but can also be appreciated as decorative art pieces. 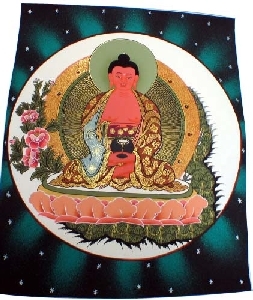 These thangkas are painted on smooth cotton canvass and are NOT framed. I have long been a admirer of these types of art and during my time in Nepal as a Peace Corps Volunteer I purchased a few. For the past year we have been searching for some high quality pieces we could wholesale and found some at great prices. These are for more of niche market, but among the holistic, spiritual crowd, these pieces of art will be very popular. Enjoy and be sure to get one for yourself :) . In order to show enough detail I have placed HUGE thumbs on this page so be patient while it loads. IMPORTANT NOTE: These paintings will NOT be packed in the padded envelope with your jewelry. Please do NOT tear open the mailing envelope that contains your order. If you do so you risk ripping the painting. 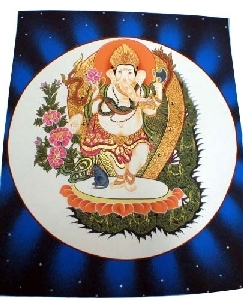 Any paintings damaged in this way is NOT OUR RESPONSIBILITY and wholesalegemshop.com will neither refund nor replace any paintings damaged by the customer after delivery. 7 x 11 Inches - Handpainted! 13 x 17 Inches - Handpainted! 8 x 10 Inches - Handpainted! 10 x 12 Inches - Handpainted!